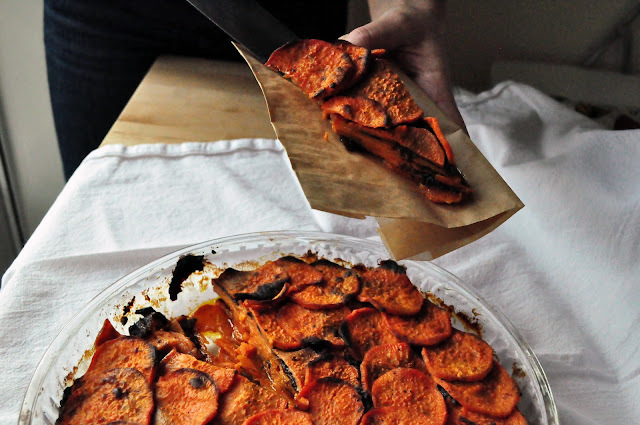 Paleo Sweet Potato Recipe: Pommes Anna. Photography & Styling Credit to the lovely and talented Ellen Kyle of Found & Created (an innovative floral / paper / design studio) for all photos in this post. It was a fun photo shoot! I've seasoned the dish with port-soaked plums, salt, and pepper in the photos above, though I also list several other approaches to seasoning in the recipe below. 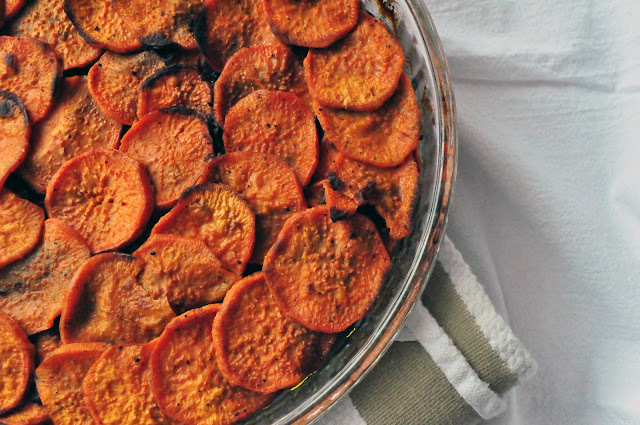 Pommes Anna makes a great paleo side dish alone or served atop a salad. Traditionally, pommes anna is a layered potato gratin of French origin that uses tons of butter and incredibly thin potato slices. It is often made in a cast iron skillet. The skillet imparts dark, crisp edges and a browns the bottom layer of the gratin. These assets are revealed when the pommes anna is flipped out of the skillet onto a plate for serving. 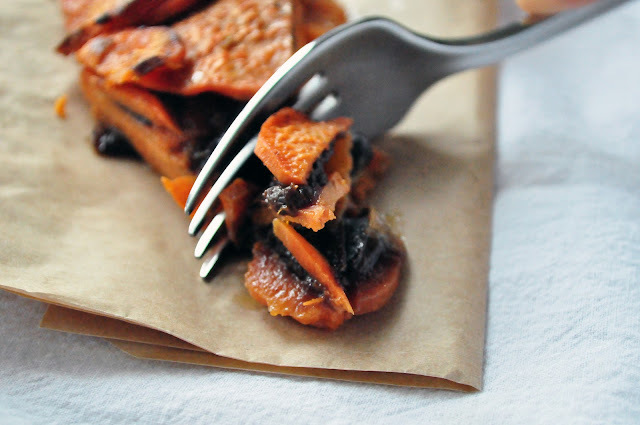 Trim slices of sweet potatoes anna are more elegant than a scooped side dish. Though pommes anna is normally made with standard white potatoes (Russet and Yukon are commonly called for), some sweet potato recipes do exist. I looked through several, but they all needed to be modified to meet the specifications of the paleo diet. Mainly, this meant finding a butter replacement. 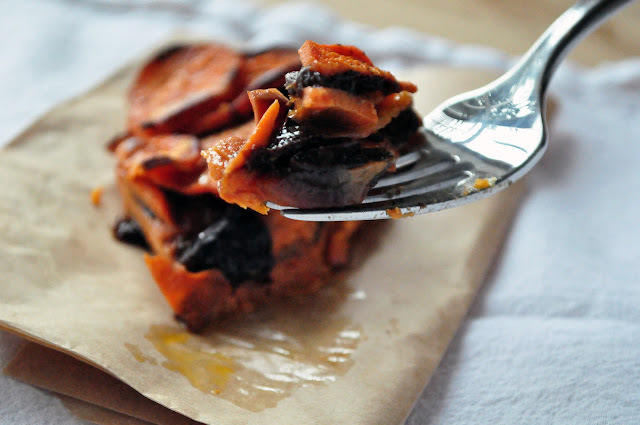 Substituting butter for paleo-friendly fats turns this into a great paleo sweet potato recipe. I knew I could cut back on the fat and still have a delicious paleo side dish. I just needed to figure out how much I could cut back. For starters, butter contains water. I knew that when I converted the recipe from butter to oil, some of those 10 to 16 tablespoons would get ditched: A standard rule of thumb when converting from butter to oil is to replace each tablespoon of butter with 3/4 tablespoon of oil. 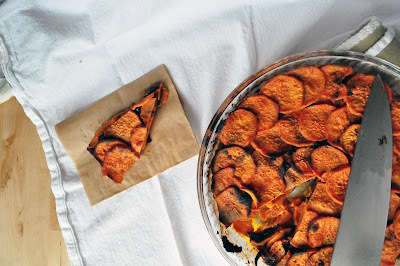 Sweet Potatoes Anna: A paleo comfort food. Using the 10 tablespoons of butter called for in one of the recipes, the conversion yeilds about 7 1/2 tablespoons of oil. Still a lot of oil. I considered this an upper limit, and added oil one tablespoon at a time to my sliced potatoes until they were evenly coated, but not swimming, in it. This came to about 4 tablespoons of olive oil. For good measure, I brushed an extra tablespoon of oil across the top of the gratin before popping it in the oven. 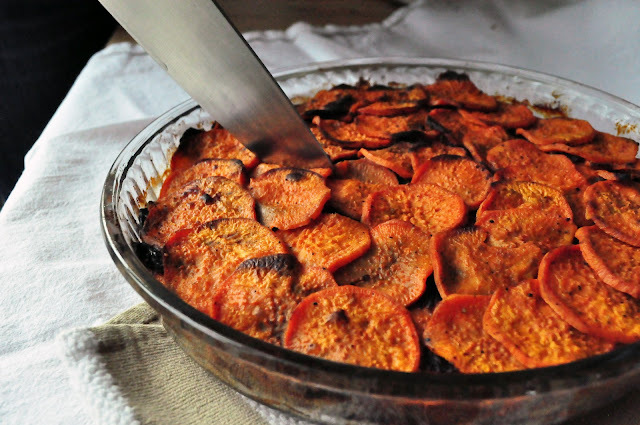 The prunes and port add a nice dimension to this version of sweet potatoes anna. Adding toasted almonds would have contributed to the texture and flavor of this recipe. So, is it a healthy sweet potato recipe? Well, there's still a lot of oil, especially compared to baking whole potatoes sans oil. But there's much less than before. Replacing butter with oil causes a problems, though: Browning. Or lack of browning, to be more accurate. Butter's sugars (primarily lactose) and proteins cause a delicious browning to occur when exposed to high heat. The process is known as the Maillard reaction. Cut out butter, and you cut out Maillard. The potatoes themselves do contain sugars, proteins, and starches, though. All of these do cause browning to some extent, but not as impressively as when you add a half pound of butter. Solution? Nothing completely restores the Maillard reaction to its former glory, but there are two approaches that can help to some extent. The fine layers of potatoes and other seasonings make this a visually interesting paleo side dish. You can try sprinkling or brushing the top of the pommes anna with a slightly sugary solution before baking. This will add back some of the sugars you've lost by having done away with the butter. You'll have to use something that has real sugar in it, though: stevia and other sugar substitutes won't work, as the sweetness of these is from sugar alcohols. Natural sugars, such as honey, agave syrup, and palm sugar will all work. Dishing up a slice of sweet potatoes anna. 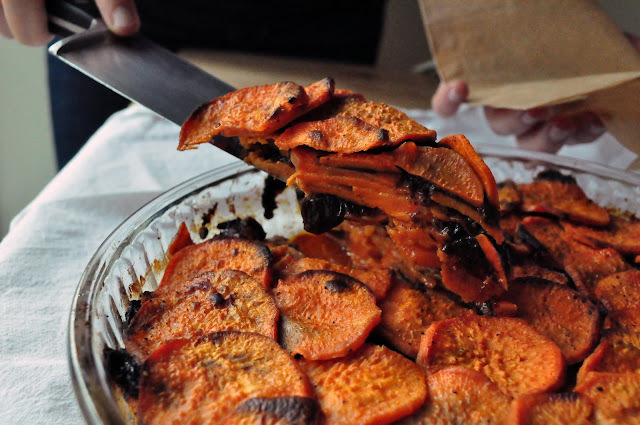 Secondly, you can carefully broil the top of the sweet potato pommes anna for a minute or so once it is done baking. Use the middle rack or else the intense heat of the broiler will quickly char the top of your creation. In the pictures, you can see that some of this damage on my own sweet potatoes anna. I moved them to a lower rack before more damage could be done. Top view of paleo sweet potatoes anna. You'll benefit from a mandoline or a food processor that can slice potatoes thinly. Never seen a mandoline before? Here's an example. These tools help you make incredibly thin slices of potato, a hallmark of pommes anna. It's certainly not necessary to use them, though: I sliced my potatoes by hand. Choose cylindrical potatoes that are similar to each other in size and shape -- they will yield more uniform slices and a more presentable end product. If you'll be using a food processor to slice the potoatoes, choose thinner potatoes that will fit into the food processor feeding tube. For a flatter, more compressed potatoes anna, place a heavy second pan on top of your potatoes for the first half of the cooking time. If you are using oil instead of butter, consider brushing a sugar solution over the top of the potatoes before baking them in order to promote browning. A cast iron skillet works best as a baking dish. Any other round baking dish will still work, but will not do as good a job of browning the sides and bottom of the Potatoes Anna. If you are using traditional white potatoes, choose Russet or Yukon. Don't soak the slices in water, as it will wash away much of their starch, an an adhesive that helps to hold the layers together. ~ 4 T olive oil or melted coconut oil, and another 1T to brush the top of the paleo pommes anna with. ~ 10 prunes, heated in 1 cup port for about 20 minutes or until plump. Drain and chop them. Note: If you prefer not to use port, you can use natural fruit juice or water. Optional: In hindsight, I would suggest adding ~1/2 cup slivered toasted almonds. They would complement the flavors and, most importantly, add a bit of variation to the texture. Note: Feel free to experiment with your own favorite spices, seasonings, or additions. Harissa, for example, would make an interesting addition to a savory version of this dish. Wash, peel, and slice potatoes 1/8 inch thick. Put all sliced potatoes in a large bowl. Add oil and seasonings, and mix well until the potatoes are thoroughly coated. If you really care about how the gratin is going to look, set aside about 15 of the best looking slices. Use them either as the first layer you set down (if you plan to invert the final product) or the last layer (if you plan to serve it as is). Arrange the potato slices in concentric overlapping circles. Start in the middle of the dish and reverse the direction of each new circle of potato slices you lay down. This crisscrossing helps to interlock the layers. Sprinkle your seasonings (chopped prunes/herbs and onions/pecans) lightly in between each layer of sliced potatoes as you go. Once you've filled the dish, press down hard to help pack the potatoes down. If you'd like to promote browning, brush the top with a light sugar solution, or sprinkle lightly with a sweetener of your choice (but not stevia, sucralose, or another sugar alcohol). Then brush lightly with one more tablespoon of oil and cover with aluminum foil. Place in oven and bake for 30 minutes. Remove second heavy pan and bake uncovered for another 20 - 30 minutes, or until potatoes easily yield to a fork and the top is lightly browned. Broil briefly for about a minute or so on the middle rack if more browning is desired. Remove from the oven. Either keep it in the baking dish, or invert onto a plate. Cut into wedges and serve. I'm just about to add a button to the top of the blog, too, that will do the same thing!